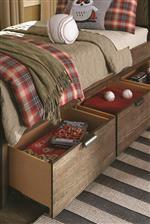 This dresser offers plenty of space for your child to store his or her clothing, accessories, or toys. The piece features six drawers with simple finger pull hardware. Block legs and clean lines give the dresser a simple, contemporary look, while a mix of wood veneers adds rustic appeal. The Fulton County Dresser with 6 Drawers by Legacy Classic Kids at Janeen's Furniture Gallery in the Visalia, Tulare, Hanford, Porterville, Exeter area. Product availability may vary. Contact us for the most current availability on this product. The Fulton County collection is a great option if you are looking for Casual furniture in the Visalia, Tulare, Hanford, Porterville, Exeter area. Browse other items in the Fulton County collection from Janeen's Furniture Gallery in the Visalia, Tulare, Hanford, Porterville, Exeter area.